Fox Narrowboats | Charlie Fox Narrowboats: Where are They Now? Home › Blog › Charlie Fox Narrowboats: Where are They Now? How long have Fox Boats been building boats? What is so distinctive about a Charlie Fox Boat? How many were built and where are they now? A select few narrowboaters on the English waterways share an exclusive and niche interest in Charlie Fox Narrowboats. Our unique family boating service was established in 1952 by the enigmatic boat builder Charlie Fox. In 1977 we also became a hire boat fleet and by 1981 we had moved into our current purpose built marina, which now has moorings for 200 craft. The company was renamed Fox Narrowboats Ltd in 2004. Charlie Fox boats are recognisable by the distinctive stem post, which is the fore post of the boat that forms the apex of the bows. Some however, have had it cut off, or in the case of a boat built for a customer, left off at their request. This V-shaped nose is something that other Charlie Fox boat owners look out for, when spotting one another on the waterways. We now build one or two boats per year for our hire fleet. After five years we sell off hire boats, which are quite sought after, and for which there is generally a waiting list. We also sometimes build new boats on commission, so there are now approaching some 200 Fox boats in existence. Three Fox Boats were originally built for St. Johns Ambulance, and are wheelchair accessible. Samuel Slater was built as a millennium project and was exported to be used in Pawtucket, Rhode Island, USA, as a trip boat. Each Charlie Fox boat is numbered, with the number welded into the water tank access plate at the front of the boat. Curiously, there are two boats with the number 80. Some Fox Boat enthusiasts like to see how many of the boats they can spot and what their numbers are. About a year ago Peter sold March Mole to Tina Catling, and the boat is now in York. 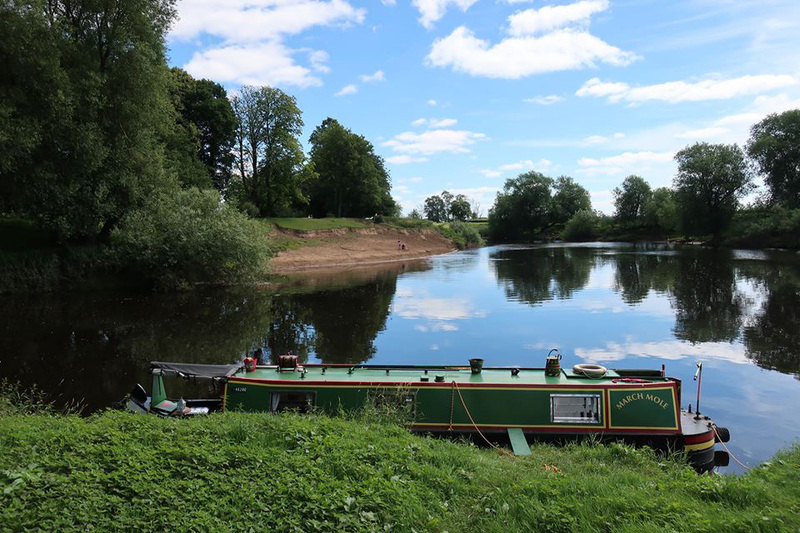 Tina was kind enough to supply these photos of the interior, and of March Mole moored at the meeting of the Rivers Ouse and Nidd near Nun Monkton. The previous owners told Peter to remember his boat number, as you would get people asking. On his very first cruise with March Mole, that actually happened, much to the delight of those enquiring. Their boat was called Herbal Second Boat. Chris Howes, now a mooring customer at Fox’s marina, was moored at Berkhamstead a couple of years ago when Peter approached him wanting to know the production number of his narrowboat to add to his now growing spreadsheet of Fox-built boats. Chris and Christine’s boat is now called Lily May, having been repainted and renamed by Paul, the previous owner, (renamed after his mum). She was built 2007 and named Swift Fox. She spent her first five or six years as a number of the Fox hire fleet, Paul bought her around 2012 and Chris and Christine bought her in 2015. When Sarah Hacker met her future husband in August 2004 one of their first dates was a few days away on the family narrowboat, Aqua Roma, built by Charlie Fox in 1976. This sparked a passion for narrowboating and an interest in Fox Boats which lead her to contact Peter Ekins. March Mole is the direct sister of Aqua Roma. Peter was kind enough to supply his list of boats, and Sarah and her family continue to look out for Fox Boats on the waterways. In 2014 Sarah managed to track down Fox Boat Ambassador, on the Ouse at Ely, which she had considered buying at one point. You can read the narrowboat adventures of Sarah’s boating family at her Narrowboating Chick blog. Zoe Louise McPhilbin ‎contacted Fox Narrowboats on Facebook to say that she had welcomed R Squared to her family in May 2016, and in 2017 she was returned to her given name, a different Swift Fox, (no. 87.) Fox’s re-use names; for example there have been several Fox Hunters. Zoe absolutely loves her boat, which is still in great condition. Rena and Chris Owens now own Vermuyden, moored at Golden Nook moorings near Chester, and Foxhunter (no.19), is also moored at Golden Nook Farm. She has been Craig Sheaf’s home for five years, and is undergoing a major refit at this time. Shellfen 2 is currently moored at Swanley Marina on the Llangollen canal at Nantwich, and is owned by Rachel Elizabeth. I’ve enjoyed discovering the stories of these boats, they are so very well loved. Do you own a boat built by Charlie Fox? Swap pictures and stories in the Facebook group: Charlie Fox Boat Owners Group. and let us know about your own boat by commenting on our Facebook page. PS: There’s still time to grab a Christmas gift voucher for a surprising family gift this year.